The Ageless Derma Skin Care Company is announcing the introduction of an organically based cleansing gel for the face that will clean, moisturize, tone and give renewed health to facial skin. Their Super Green Natural Gentle Facial Cleansing Gel contains carefully picked organic ingredients certified by either Ecocert or the Natural Product Association (NPA). The Ecocert body was first established in France and documents the compliance of products to their strict sustainable, organic and environmental standards, particularly regarding ingredients contained in natural cosmetics. The NAP was the developer of the Natural Standard and Certification for Personal Care Products that allows products to be called “natural.” Ageless Derma’s Super Green Natural Gentle Facial Cleansing Gel has been certified by these two consumer agencies to contain all natural ingredients, be non-toxic, have no animals testing involved in its making, and uses environmentally correct packaging. 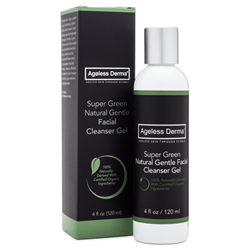 The ingredients placed within Ageless Derma’s Super Green Natural Gentle Facial Cleansing Gel consist of shea butter for luxurious and natural moisturization. The shea butter used in this product is not processed; it is all natural. The Organic Shea butter smoothes dry, rough skin, wrinkles, scars and other signs of aging. It will also soothe minor burns that can occur from sun exposure. The skin’s roughened texture that can be the result of razor burn, such as bumps or blemishes, too, will be improved. Organic Chamomile Extract is in Super Green Natural Gentle Facial Cleansing Gel for its natural flavonoids and essential oils, both of which aid the skin in various ways, especially extremely sensitive skin. Chamomile is an anti-inflammatory agent that will soothe irritations, in addition to the aloe vera and olive leaf extracts that are also contained in Super Green Natural Gentle Facial Cleansing Gel. Olive leaf extract can actually boost the skin’s immune system function and its blood circulation, giving it a refreshed and healthy new glow. This Organic olive leaf extract cleanses the impurities from skin without stripping its natural oils. Ageless Derma products are formulated in FDA-approved Labs. All ingredients are inspired by nature and enhanced by science. Ageless Derma products do not contain parabens or any other harsh chemicals, and they are never tested on animals. The company has formulated five unique lines of products to address any skin type and skin condition.